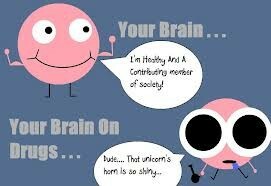 Drugs are very bad for you! In just cigarettes alone, there are hundreds of chemicals like acetone, cyanide, lead, and arsenic... that's just a few! And cigarettes are legal, so imagine what's in illegal drugs like cocaine or marijuana. Do you really want to put these in your body? Plus, it damages your body in irreparable ways. Just Say "No!" to Drugs! What kind of damage can drugs do? They can't be too harmful! 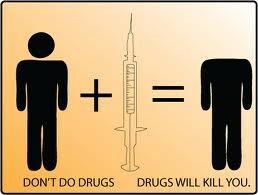 Drugs are just about the most harmful substances on Earth if you use them. When you use ecstasy, it could make holes in your brain and give you major dental problems due to involuntary teeth clenching and grinding. When you smoke a cigarette, it only takes eight seconds for the nicotine to reach your brain, start restricting your blood flow, and giving you increased chances for lung and throat cancer. Smoking marijuana impairs fine motor skills and judgement such as catching a ball in a baseball game. Just imagine if you did one of these drugs just once. You would be suffering in a heartbeat! I can just do this one time, and I won't get addicted for sure. What else can I do besides drugs? That's what everyone else does! You don't always have to follow everyone else! Just be yourself. You could get interested in art, musical theater, or join a club at your school/college/community center. You can buy a pet to play with, go on the computer, read a book, play in the park... there's endless possibilities! Plus, you may make new friends or relationships that can last forever, and that are more substantial than depending on drugs. See what happens? You get the picture now. 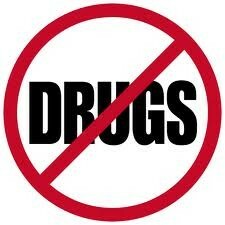 Go out there and make a difference... Stop using drugs today!